SUBHEAD: Fukushima meltdown continues to release unmeasurable radiation. US 'woefully' prepared for such an event. Image above: A transformer fire on 7 March 2016 at Oconee Nuclear Power Plant in North Carolina shutdown the Unit One reactor and burned a critical power line causing a nuclear alert by Duke Energy Company. From (http://www.wyff4.com/news/fire-at-oconee-nuclear-station/38371590). On the five-year anniversary of the Fukushima Daiichi nuclear disaster in Japan, the U.S. has failed to learn from that accident and put in place the necessary prevention and evacuation guidelines, nuclear experts warn. "Not only is there no Plan B for what to do if and when a Fukushima-style disaster happens in the U.S., there is no Plan A to prevent one either," said Cindy Folkers, radiation and health specialist at the anti-nuke advocacy organization Beyond Nuclear. Public health is woefully under-protected, she added. In the U.S., there are 30 GE boiling water reactors "identical in design to those at Fukushima" still in operation, the group said, noting that the GE model is the kind most vulnerable to risk. The reactors are known as Mark I and Mark II. 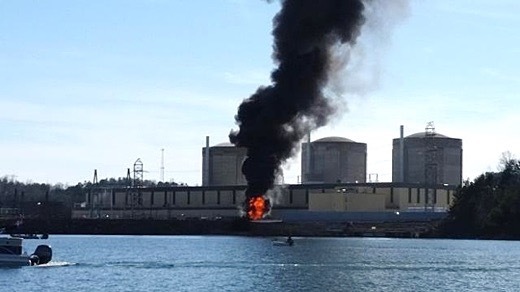 Despite the risk, industry lobbyists have blockaded efforts by the U.S. Nuclear Regulatory Commission (NRC) to require installation of radiation filters that would improve public safety in the case of a power plant disaster. "All of Fukushima’s lessons warn against a nuclear industry that protects its profit margins over public safety margins," said Paul Gunter, director of Reactor Oversight at Beyond Nuclear. "The Japanese concluded that Fukushima was a preventable tragedy resulting from collusion between industry, government, and regulator. But here in the U.S., the NRC has chosen to cave to industry financial concerns while gambling with public health." In a report published earlier this month, the Union of Concerned Scientists (UCS) called the NRC's progress on nuclear safeguards "insufficient," stating that the commission "rejected or significantly weakened key common-sense recommendations made by its post-Fukushima task force and others to enhance nuclear safety and has yet to fully implement the reforms it did adopt." "Although the NRC and the nuclear industry have devoted considerable resources to address the post-Fukushima task force recommendations, they haven’t done all they should to protect the public from a similar disaster," said report author and UCS senior scientist Edwin Lyman. "If the NRC is serious about protecting the public and plant workers, it should reconsider a number of recommendations it scrapped under pressure from plant owners and their supporters in Congress." Meanwhile, a separate nonprofit group, the Disaster Accountability Project, on Friday released a report which found that the 10-mile evacuation guidelines for a nuclear disaster in the U.S. have not been sufficiently updated to ensure public safety since the Fukushima accident. Investigators with the group found that emergency planning at the Diablo Canyon Power Plant in southern California, for example, are "dangerously inadequate," especially for communities in the surrounding areas, such as Santa Maria, Lompoc, and San Luis Obispo. "It's not even on their radar," Disaster Accountability Project executive director Ben Smilowitz told the Lompoc Record. The groups released their findings to coincide with the March 11 anniversary of the 2011 accident, when an earthquake-triggered tsunami flooded the Fukushima plant and caused the meltdown of three reactors, in the worst nuclear disaster since Chernobyl in 1986. As Beyond Nuclear noted, more than 32 million people in Japan have been exposed to radioactive fallout due to the meltdown, with cleanup costs topping $100 billion and counting, while Greenpeace Japan warned last week that there is "no end in sight" to the ecological impact in the region. "The U.S. risks an American Fukushima, not just due to a variety of natural disasters, age-degraded equipment breakdowns, or operator errors, but also due to sabotage or attack," said the group's radioactive waste watchdog Kevin Kamps. Video above: Presentation by from 2013 by Hiroaki Koide, Master of Science in Nuclear Engineering produced by Cinema Forum Fukushima. From (https://youtu.be/clmHptj2RVo). As we learn in this wide-ranging and important interview [with Hiroaki Koide], the accident often referred to as 3/11 was enormous and in many ways unprecedented. The full scope of the disaster is still unknown, but is clearly on the scale of Chernobyl, placing the amount of radioactive material released… up to 1,000 times the Hiroshima bombing of 1945. Is it time to switch to climate panic?